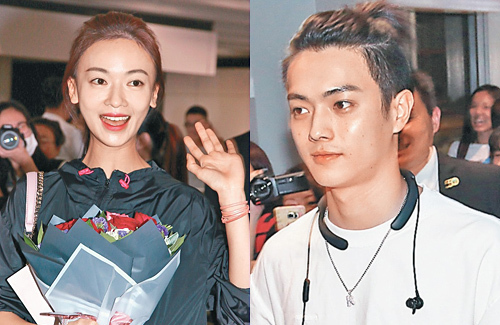 Welcomed by a large crowd of enthusiastic fans at the airport, Wu Jinyan (吳謹言), Xu Kai (許凱), and Su Qing (蘇青), made their way into Hong Kong to promote their hit series, Story of Yanxi Palace <延禧攻略>. Although Jinyan was flagged for giving off a diva attitude ever since she was propelled to stardom from her lead role in Yanxi Palace, she arrived at the airport with nothing but smiles. Waving at the fans who waited for her outside the gates, Jinyan happily accepted dozens of cards, gifts, and flowers. Hoping to connect with her Hong Kong fans, the actress even said “Hello, everyone!” in Cantonese. In stark contrast to her friendly attitude after arriving in Hong Kong, Jinyan was previously hit with negative rumors that she was a diva who purposely did not show up for a filming production, causing her to be blacklisted by a lot of media companies. She was also said to have attended New York Fashion Week in a sour mood, having remained expressionless and ignored a lot of the reporters who wanted to talk to her. Xu Kai, who also arrived in Hong Kong, was dressed down and was welcomed with double the number of fans that waited for Jinyan. However, many fans noted that Xu Kai gained a bit of weight since his role as the beloved Fu Heng in Yanxi Palace. Remaining quiet, he did not respond to questions when reporters asked him about his rumored relationship with mainland actress, Bai Lu (白鹿). Surprised by the warm welcome for her, Su Qing was initially afraid she would be the target of hate after arriving in Hong Kong. Su Qing said she was worried of fans getting too invested in the drama and yelling at her on the streets because of her villainous role as double-crossing Er Qing.